In the world of the rich and famous, you’re nothing without a superyacht. And up until now, the market has been skewed toward the male multimillionaire. 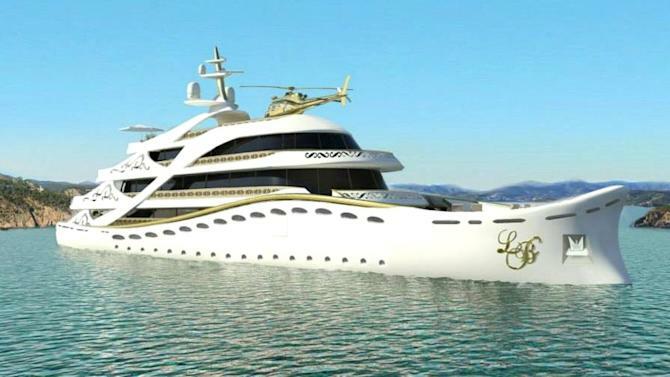 But “from today the world of luxury superyachts is open for ladies as well,” according to Lidia Bersani, a designer who has drawn up plans for the first superyacht aimed solely at women. Bersani has turned her luxury interior design skills to produce La Belle a concept design for a “elegant and feminine superyacht”. The 80 meter boat is designed for 12 people, boasts 5 decks, a master bedroom with a large circular bed, and five guest suites. On board is a beauty center, disco, cinema, bars and a well-equipped spa. “Today luxury yachts are primarily focusing on the entertainment and sports of men, with or without their girlfriends,” Bersani told CNBC via an email. “I am a lady myself, that mean I understand the desires, dreams and tastes of women very well. I can tell you, we are not dreaming of watching football with a glass of whisky while smoking a cigar,” Bersani said. – Found this as a headline with CNBC this article is solely their property, but as a woman who is proud to enjoy watching sports and relaxing in a “man cave,” I have to ask is the view of a yacht, “just for women,” continuing to limit woman to certain spheres? Yes this specific yacht is designed for a woman for money, but just because she is a woman and has money does that mean she automatically needs a disco, spa, and a beauty center? Just wondering how far women have actually come if this is a design just for us and really its painting a particular picture of what we would like.